I am from Sha’b. I was 20 years old when I left Palestine. From the beginning of us leaving Palestine, the Arabs were preparing tents so that we would leave. They said to us, “You should leave because the Jews will not put up with you, they do not want you in the country. Leave now, it’s better for you”. The Arabs forced us. The women continued taking water to the revolutionaries and fighters. At the time of a wedding, the girls and young men would line up in a single line. They would carry the clothes of the groom, the blessed groom, and they would circle with the tray, while the groom would circle on a horse. There would be a seamstress pretending with an empty needle without a thread, just pretending. Clothes and a wedding dress for the bride: she would go to Yafa or ‘Akka to get the fabric, and give it to the seamstress. She would put henna on her thumbs and feet the night of the wedding (her friends put the henna on her), and she would have her hair done as well. They would sing for the bride at the time of the wedding as well as at the time of the henna. When I got married, I went with my mother-in-law to the seamstress and she sewed my clothes and dresses. Later, when the clothes and everything were ready, we went and made the wedding at ‘Anjar (in Lebanon), and they gave me ten pounds. I bought gold from Beirut -- in Sha’b there was no gold and not many traders. Most people were farmers who grew sesame, corn, watermelons, and melons. During the Eid, they would bake ‘Eid cakes and distribute them in memory of the dead. Children would go to the swings, and buy clothes for the ‘Eid. “The pilgrim went by sea, in his hand a keela/ Oh Lord bring him back safe to this family”. The funeral: Lamenting and wailing! The dead person’s family would pull out their hair, wailing, crying, and beating their bodies. When visiting the grave, the same thing. Actually here it’s easier than in Palestine, they simply weep for a while, and wail. The neighbors used to bring cooked food for the dead person’s family for a period of three days. Afterwards the dead person’s family would cook and distribute food for three days. I was veiled, I was committed to religion. All girls wore the veil from childhood. In regard to maquillage, there was nothing of that sort. However, for a bride, a woman would do her makeup, wax her and put makeup on. Visiting the sick: They would take fruits -- grapes, oranges and apples to friends, but if it was a stranger they didn’t take anything for him. There was no doctor in the village they would go to the hospitals of ‘Akka or Haifa, as they were famous for that, everyone went to them. There was a bus that came everyday to the area and took people to ‘Akka. “Circumcise, oh circumciser, with the silver razor/Watch over him, oh circumciser, until he is alright/ Circumcise, oh circumciser, with the gold razor/Be patient with him until his family comes”. It was forbidden for a girl to love, or her family would shoot her. It was also forbidden for her to refuse a bridegroom. It had to be as her family wanted. Women’s gatherings: Most women were busy with agricultural work, such as harvesting watermelons, and picking sesame and olives. The men would cultivate, and the women would help in collecting the watermelons. It was forbidden to sing on the threshing floor while they were working. During the harvest season, the young men would rent harvesting machines. But when Israel came, they [Jewish settlers] brought machines that harvested the wheat in a more advanced way. There were two Christian families [in the village], but they moved to Kfar Yaseef. All of them [people of Sha’b] were Palestinian and Muslim Arabs. All of the people in Nahariyya and Tel-Aviv were Christian. There was a mosque that still stands still now. I know from my sister who lives in Palestine, and the mosque has been very much improved. Tool: After a stone has been burned, it becomes limestone, and they make a hole, and they buried the person killed for revenge under it. I used to have an old dress from Palestine. Once I went on a visit to Palestine, and my daughter threw it away, and even my wedding dress, because they were old. Fishing: There wasn’t any because the sea was far. They used to bring fish from ‘Akka. There was a well fixed in the ground as a tank with many fountains or faucets bringing forth water. There was a spring called Al-Ayn and the water was very good and plentiful. They [women] would go collect water from there. It was far from the houses and they would go and play with the jars, and sometimes they would carry them on a donkey. If someone wanted to build he would bring water on a donkey. Problems: There were party conflicts. Two young men were killed. At that time there was a committee and a mukhtar but those people didn’t listen to them, so sometimes there was revenge. The foodstuffs they used to make were cheese, butter and oil. People would live for a hundred years, because food was healthy and there were no chemicals in it. The young men of the village agreed to buy arms at their own expense and to resist the Jews. Many martyrs were lost. There were no organizations, it was only those ready to defend Sha’b. Israel would come to search for arms and take them, and sometimes they would shoot any man who had a weapon. When the Jews withdrew from our village, they would take horses, cows, and camels… Israel distributed sugar and flour to the shops at one time, or aid came from UNRWA. There were many cases of corruption, people informing on other people, I mean collaborators with the army. There was love and affection between neighbors. When someone was sick, neighbors would bring wheat, olives and tea cups. There was no market in the village, they would go to ‘Akka. وقت العرس يصف البنات و الشباب صف واحد, صاروا يحملو تياب العريس ( الهناء) و يدوروا بالصدر و العريس داير بالفرس و كان خياطة قال تحكيلوا بس بإبرة فاضية بدون خيط فقط شكليا. وقت لما تزوجت, روحت مع مرت عمي ( حماتي) عند الخياطة, خيكتلي تيابي و فستايني و بعدين بس جهز التوب و كل شي رحنا عملنا العرس بعنجر و كسوني 10 ليرات. اشتريت الذهب من بيروت, بشعب ما كان في ذهب ما كان في تجارة كتير, معظمها زراعة سمسم و ذرة و بطيخ و شمام. ايام العيد كانو يعملو كعك العيد و يفرقوا عن روح الاموات و الاطفال يروحو يتعنزؤا على المراجيح و يشتروا تياب العيد.
" الحج نزل البحر بإيده كيلة يا رب تجيبوا سالم على هالعيلة"
الاجر: ندب و صريخ.... اهل الميت يمعمطوا شعرهن و نويح و بكا و لطم. و وقت زيارة التربة كمان نفس الشي. يعني هون اهون من فلسطين, لان بيعيطو كتير و هيك.... كانوا الجيران يودولهن الاكل و الطبيخ لمدة 3 ايام. بعد 3 ايام اهل الميت يطبخوا و يوزعوا. انا كنت محجبة ( متمسكة بالدين), كل البنات محجبيت من صغرهم. بالنسبة للمكياج ما كان في ابدا. اما العروس في وحدة بتحففها و تبرزها. زيارة المريض: كانوا ياخدو فواكه و عنب و برتقال و تفاح... للاصحاب اما الغريب ما كانوا يوخدولوا. ما كان في طبيب بالقرية, كانوا يروحوا على مستشفيات عكا و حيفا, هناك كتير مشهوريت الكل يروح عندهن. كان هناك بوسطة كل يوم تجي على المنطقة و تاخدهن على عكا. طهّر يا مطهر بالموس الذهبية اصبر عليه تايجوا الاهلية"
ممنوع البنت تحب او كانوا يطخوها اهلها, ممنوع ترفض العريس كمان, متل ما بدهن اهلها لازم. ديوان النسوان: معظم النسوان كانت مشغولة بالزراعة و تحويش البطيخ و قلع السمسم و الزتون. الرجال بتزرع و النسوان بتساعد بنكش البطيخ. و كان ممنوع يغنوا بالبساتين و هني عم يشتغلوا. ايام الحصاد كان يستأجروا الشباب او يستأجروا الحصادي ( المكنة) و لكن لما اجت اسرائيل جابت آلة بتحصد القمح بطريقة متطورة. كان في عيلتين مسيحيية و بعدين فلوا على كفر ياسين, كلهم فلسطينية و عرب إسلام. نهريا و تل أبيب كلها مسيحية كانت. كان في جامع و بعده لهلأو بعرف انو بعدوو من اختي اللي بفلسطين و كتير محسنين الجامع. تول: يعني حجارة بعد ما تحترق بتصير كلس بيعملوا فيها جورة و بيدفنوا القتيل وقت الطار. كان عندي تياب قديمة من فلسطين. رحت زيارة مرة على فلسطين و كبتن بنتي و حتى بدلة العرس لانهن قدام. صيد السمك: ما كان في لان البحر بعيد. كانوا يجيبوا السمك من عكا. النبع كان عين و المي كتير منيحة و مفيدة. بالشتاء يروحو ياخدو مي من هناك. كانت بعيدة عن البيت و يروحو يلعبوا بالجرة و مرات يحملوها على الحمار. يلي بدو يعمّر يجيب مي على الحمار. خسوف القمر: يروحو الرجال و الشيوخ على الجامع يدعوا الغيث " قمرنا اكلنا الحوت"
الاكل هني كانو يعملوه: جبنة و سمنة و زيت. كان يعيش الرجال 100 سنة لان الاكل كان كلو صحي و ما في كيماوي ابدا . كانوا شباب البلد يتفقوا و يشتروا سلاح على حسابهم و يقاموا اليهود. كان يروح شهداء كتير. ما كان في تنظيمات, كان بس في حامية شعب. كانت اسرائيل تيجي تفتش على السلاح و تاخدو و مرات يطخوا الرجال يلي معها السلاح. وقت ما انسحبوا اليهود من البلد اخدوا الخيل و الفرس و البقر و الجمال... اسرائيل كانت توزع سكر و طحين للدكاكين بفترة او تموين من الاونروا. كان في كتير حالات فسد, ناس يفسدوا على ناس, يعني عملاء للجيش. ما كان في سوق بالبلد, كانوا يروحو على عكا. It is probable that Um Samir was married after 1948 in Lebanon. We could not check this as she became very sick after the interview with her was recorded. A keela was a container for liquid. Um Samir is wrong about this: the inhabitants of Nahariyya and Tel-Aviv were Jewish. We don’t know if she amalgamated Christians with Jews, or simply made a verbal mistake. Um Samir was not alone in confusing Israel, Britain, America -- oppressors of the Palestinians in different epochs. Oral history theorists suggest that the memory works to reorganize time and events, selecting for the most meaningful. Q: So what’s your name? A. Put Um Saleh Shaker. It’s really al-Jisheh but we removed al-Jisheh, so put Shaker. At the time when they made the statistics, they asked my mother-in-law, what is your husband’s name? She told them Abu Saleh Shaker. She gave this as his father’s name as well, though we are from the Jisheh family, she didn’t give the family name. Khelas! we stayed Shaker. Q: And you are from al-Kabri? Q: So you were mature? A: I left with a child called Saleh in my arms. Q: Really! So you were married. Well, the subject of our talk is customs and traditions, I mean what you used to do. A: You mean clothes, work, or…..? A: First of all, in Palestine we had land, houses, horses, camels, cows, and what can I tell you? That is basically what we owned. I mean we would sow and harvest on our lands. We had figs, and we had olives, and we had grapes, and we had apples, and we had... Palestine was paradise. Many Lebanese would go there. Q: Did they buy from you? Q: So you in al-Kabri, what did you grow? A: First of all we grew figs, olives, grapes, apples, walnuts, what can I tell you? Oranges, citrus – I mean citrus that is grown in gardens. We had land and the land had water [called] the ‘spring of honey’. Q: You mean it had a spring in it? A: It had two springs not one, and its water was called ‘Anaaya [healing] from ancient history, as well as the water of the ‘spring of honey’. Now they sell the water of the ‘spring of honey’ in France as ‘pure water’ -- the water of our land! A: Without exaggeration you can say that pools and springs came from this spring. We worked on it and built it, and the water went down from it to water the gardens and to water the farmlands. We had plenty of treasures, hamdillah, hamdillah! Vineyards and figs and grapes…What can I tell you? what can I tell you? I won’t speak. Every time I speak I start to cry. I don’t want to speak anymore. Q: No hajji, don’t cry. A: Let’s go slowly slowly. A: They deprived us of all the land my daughter! May God destroy them. Q: May God restore it to us, hajji. A: Another thing, it was our custom to wear long clothes. Q: Dresses! So you were unveiled? Q: Weren’t you all veiled? A: Wait! I’m going to show you the mandeel of Palestine. A: Let me get up and bring it to you, stay seated. That is what we used to make with the makouk [crochet hook]. Maybe you don’t know that term, even if we say it to you, you aren’t going to know it. A: Makouk -- it comes like this and like this. Q: It’s like a long needle? A: It’s called makook. Anyway we would use it to work with wool for mandeels, and we made mandeels here in the same manner as this one was made. A: This was our way of dressing, and that’s how we dressed afterwards. But not during the present time. This dress I am wearing now, this is how we dressed in Palestine. Q: Did you use to sew your clothes? A: Who ever had seamstresses and machines, I mean whoever had a sewing machine, she would sew for people. It wasn’t just one, not just one person, and not just one machine. Ah! There were many machines to sew for us. Q: Hajji, at the time of weddings, what would you do? A: At the time of a wedding --- first a girl would get engaged -- if you want to fix your phone, you can fix it. Q: No, this records the voice so that we can write it down later. A: Peace be on the Prophet. At the time of weddings, the first thing is the ta’leeli. Q: What is the ta’leeli? A: It is the sahra, just like they make the sahra here now. Evening celebrations would last a week in Palestine. A: The whole village would gather in the village square, and make the sahra. We called this the ta’leeli. The important thing was the day of the wedding. What can I tell you? I mean [it was as if] we wanted to celebrate all the heritage that we were following on the day of the wedding. The day before the wedding, they would pass by all the houses. If you had a load of firewood, you would carry it and bring it to the house of the bridegroom. They would invite the guests. All the guests who came would bring with them slaughtered sheep, or sacks of rice, or bags of coffee. A: Or a sack of sugar. On the day of the wedding they would do everything they could for the wedding. What can I tell you? We in our village would first go out to the wide threshing floors, you go out there to do the dabkeh, and the sahja and dancing, and everything. From there they would go down below the olive groves to an open space -- the same thing, the same programme. Then they would go up to the house of ‘Atef’, they were the neighbors of the zu’ama [leaders], then to the neighbors Sarhan. From the house of Sarhan they would go down from alley to alley, and from there to the village square. They would be carrying this rope and these lamps. They would keep the rope and the lamps throughout the sahra, for the whole evening. They would bring the singer Abu Sa’oud, and he would sing, and people would clap behind them. Q: Do you remember, hajji, what they used to say? A: Yes. What can I tell you? Someone would sing. Q: What would they say? A: Wallahi, this is what can I remember, they would sing to the official leader. Weren’t there leaders? Shall I count them? They would sing for the groom’s family, and the people and the women behind the groom were clapping. The young men would stand in front and the women in the back. This is all I know. Q: Okay, what happened when they came to take the bride? A: Wallahi, where would they take her? To the house of the groom. The people followed her. They would place her on a horse. A: On a horse, yes. And the groom’s mother would have a dress kept from her wedding, and it would be placed on the horse, and the groom would ride the horse around the borders of the village/, and after he had ridden around the village, they would put his mother’s dress on the horse. When they brought the bride to the house of her in-laws, the same thing would be done. A: Yes, the same thing. And they would chant for her “This is the great one, the daughter of great ones. I want to do the sahja at the door of the great, and the glorious one does not enter except with two big dinars”. A: The family of the groom would take her, and give her money, and bring her down from the horse. Q: Alright, so at the time of the henna, did they make her a henna party? A: My dear how wonderful are the things I’m telling you! The henna had its own evening of celebration, for the young women and the young men. The young men were on one side and the young women on another side. Q: The young men used put on henna as well? A: Yes. Those who wanted to put henna on their hand and those who didn’t want to didn’t. Young men were different in those days. They wore the shamleh and the sharwal. I mean the young men then were not like the young men today -- we call them ‘nylon’, wallahi ‘nylon’. Did we have young men who would tie their hair up like nowadays. The young man meant a man then. A: Yes, a man who goes to work, a man who “if you throw him in the saha he stays upright on his feel”, whatever he does he’s a man. This generation is all ‘nylon’, young men and girls, I mean isn’t it a shame to lie? Q: Certainly. Those who didn’t wish to put henna on their hands, what did they do? A: Everyone would put henna. The young men and the best man would put on henna during the henna night. The groom was invited to someone’s house, I mean to put on the henna, him and the other young men. His two best friends were strong; they wouldn’t let the groom be kidnapped from among them. If other young men were stronger than them, they would kidnap the groom and go. A: They would not let the groom go unless his best friends pay. But it was a joke among the youth. This is how weddings were with us in Palestine, very beautiful. When the bride had put henna on her hands they would mount her on a horse, they would make her hands like this, and tie the mandeel around her; a mandeel that had oyya on it. Q: What is an oyya? A: It’s wool. We would buy wool and place it on her head, and sequins like this, I mean we would put two bits of wool with sequins on her head, so that she would shine all shiny. Like she carries roses now. Q: During the ‘Eid, hajji, the two feasts, al-Fitr and al-Adha? A: The two feasts remain the same with us, people make ka’k. A: Ka’k with halloum, walnuts, sesame, you make them also with dates as well, in every house, but only on the day of the feast. Whether for the small or the great feast one had to make at least forty cakes. During the Thursday of the Dead the women also cooked everything, and they would carry the food on their heads and distribute it in the cemetery, and distribute it amongst the poor. Some would slaughter animals and distribute the meat, and some would cook food, hamdillah! The earth’s riches in Palestine were very beautiful, and Palestine was very beautiful. Q: Good. During the feasts, where would you go out to enjoy yourselves? A: We would celebrate the feast with one another. As the saying goes, pray the prayer for the ‘Eid, and it guides those who have a woman relative to visit her. It’s a duty for every man, him and his children, to celebrate with his sister, and his aunts from both sides of the family, and to celebrate with his friends. This was the ‘Eid for us. We girls would make kibbeh binat, even when we were young girls. Q: What does kibbeh binatmean? A: Kibbeh binat means you take a little meat and a little burghul. Q: Ah, the usual kibbeh? A: Yes, but they called it kibbeh binat. And the girls would go out on the swings and swing on them. Q: The girls were like that? For example you were sixteen years old, like the young ones girls would go on the swings too. They didn’t go on the swings with the boys. There was a zanzalakhti tree, you don’t know it. Here there was a tree and there there was a tree. They would tie a rope between the two trees and hang the swing on it. A: Zanzalakhti, you don’t know it? “’An zanzalakhti, ‘an zanzalakhti, she met him at the zanzlakhty tree, and my sister married him”. Our heritage in Palestine was beautiful. And the bride they bring her from outside would ride on a howdaj. Q: You mean on a horse? A: On a camel. They would ride her on a camel, when she came from outside, a stranger, they would put her on a camel, and it was called howdaj. Ah! our weddings were very beautiful. The slaughter of sheep and the food! The whole world was beautiful on the day of the wedding. Q: They slaughtered animals like that? A: Yes! They slaughtered and slaughtered as they do now! They would make plenty of food. At least for a wedding they would slaughter ten to 15 sheep. In our village, al-Kabri, we would invite Tarsheeha, al-Kwaykat, Ghabsiya, al-Nahar, al-Bassa, and al-Zeeb. And it wasn’t just us, al-Kabri, everyone who wanted to make a wedding invited all the villages around. You should see all the guests arriving! A: You see the wedding had its value, the sahja had its value, everything had its value. Now here we don’t have this. Q: What is the sahja? A: The sahja is when the singer chants and the young men clap and the poet continues praising, and the young men begin to jump around. The groom’s mother would come with his aunts and relatives and they would put a wooden serving spoon, moghrafa as they call it now, and the groom’s mother would dance in the sahja holding the moghrafa. Q: So did you have anyone who went on the pilgrimage ? A: They would go on the pilgrimage on camels. The pilgrimage had many very difficult things. They would go on camels and would sometimes be very late returning from the hajj. Q: Really? How long did they take? A: Wallahi, I don’t know exactly. Q: I mean did they take a long time on camels? A: I know they took a long time, and the hajj as well. They would make a sahra for three days: “A joyful hajji, a spiritual hajj, may the going and the returning be joyful. When the pilgrim came back from the pilgrimage, there was something called “a child of the hajj”. Those people would have the tool -- you don’t know what the ‘iddeh is. It is a banner, like plates, and people would do the work of it, and they would put the banner -- how can I explain it? They would say, “Look! Abu al-Hayjja has arrived/and on his shoulder the flag flies/ I dedicate your place oh sacred city/ Abu al-Hayja has arrived/ and upon his shoulder the flag flies”. And the children of Abu al-Hayja, one of his children would raise the flag, and they would go and clap for the pilgrims and welcome them, and praise God. It was something beautiful. Q: Do you have anyone, your father, or your uncles, who made the hajj? A: They made the hajj hamdillah! but they passed away a long time ago -- after all I am 80 years old. Q: I want to ask you, when you used to prepare their clothes, did you sing for them? A: Wallahi, I don’t know that either, I didn’t learn them [the songs]. Q: You would put henna on them, correct? A: Yes, yes. Those who came would put henna, the elderly women who as the proverb says: “Joyful health in going and coming”. They are still marked [with henna]. Q: During the time of mourning and condolences, when someone has passed away, didn’t you say that when someone dies, the neighbors would cook for them? A: For three days the dead person’s family didn’t taste a thing -- three days! Q: When you went to visit the sick, what would you take him? A: What we would take them? Coffee and such, like they do today. Coffee, sugar, rice – In those days rice had its value, for example we would take two rotls of rice. We took by rotl. Yes two, three, four rotls for those that took rice or even coffee. And those who took coffee, it wasn’t like now – they carry it like this by hand. No, they would take a sack of coffee, raw coffee, when they wanted to visit the sick. And whoever wanted to go to a wedding would take sacks of coffee too. Q: Alright. So you had land? A: Thank God, we had land, and vineyards, and olives. Yes, us! I who you see here would go out to the vineyard, a girl of 12 years old, to gather [things] from the vineyard, and I’d put them on my head, and a basket of grapes in my hand. In Palestine a girl of eight or nine years old wouldn’t sit at home. We didn’t have girls who sat at home. Q: Okay. Weren’t there schools? A: There were schools but not for us. I mean not for us girls. Only the boys were taught, not the girls, not all of them. Those who had wealth would teach their children. There was someone in the village who taught the children, and someone from Sidon, so there were two teachers. And in the school, my grandfather, Sheikh Shaker taught, but what? the Quran. He taught at al-Kabri, as well as the people of Ghabsiyeh. And Ghabsiya built a school and children from al-Nahr, Kwaykat, and al-Kabri, all of them came here and were taught by Sheikh Shaker. How did he teach them? To memorize the Quran. Cooking and slaughter, as well singing for him. Q: What did they sing for him? A: When they had finished [learning] the Quran, they would sing for him as if at a wedding. Q: When the harvest season came, would you go with your brother and your father, or did just the men go? A: Men and women went for the chickpeas, lentils, beans and kursana, which is not known now. A: It was fed to the camels. A: Men and women would go out for the cotton as well. And in harvesting, women and men. The men would pick the cotton. There was a large area where it would be piled up, The women would pack the piles. The young men would also pick the cotton and make the piles, and the women would carry them, and put them in large stacks. I who am talking to you, we had camels, and my father used to go and carry loads on the camel. It wasn’t just one person that had camels. It was like now, everyone has a pickup truck to carry loads. Q: Did you own camels? A: Not just us, many people in our village had camels. During the harvest season you needed camels, and in the firewood season, and in the time of cutting wood, whenever they cut things. Some people carried on their head, and some put things on camels. For example, if we wanted to pick oranges and send some to Safed and send some to Tarshiha, or to send a load to Kwaykat market – wherever there’s a market, you know what I mean? Q: In al-Kabri didn’t you have a market to distribute, to buy and sell things? A: In al-Kabri we had the custom that anyone who had land with figs, grapes, and cardamom would feed the neighbors. My father (God rest his soul) when I was young used to tell me, “Yaba, when you pick figs and carrry the pan on your head, to whomever you pass say ‘faddilu’” [“Please take some”]. “I offer you, and what you eat from it is blessed by God ”. This I still remember, these old words. Now, today, you go and buy a kilo of grapes, you put them in a bag, and go home. In the old days we put them in a basket or in a pan on our heads, and another basket in our hands. Now today these things are no more. That type of basket in our hands no longer exists. Now whenever we sit we say may God deprive you, oh Israel, as you deprived us of our property. Q: Of course it isn’t as good now as it was back then, growing things with your own hands. A: I don’t know how to tell you about our land when we were young. We had darmayhima that you don’t know, qassassiya and ‘deenariyee’ and khurfaysh, herbs grown in the wild, all of which you’ve never heard of, that were used as medicine. We would dig up all these things and take them as medicine. Look at the colour of the skin of the elderly who left Palestine, their eyesight! I am an elderly woman and I work more than younger relatives, why? Because back then was different from now with all these chemicals. Go and buy a bunch of parsley now, it smells. There is no more of picking from the trees and simply eating. As the saying goes “You have figs, wait for the young girls to go out to pick from the vineyard”, really to pick whatever you desired. Pick grapes and eat them, whatever kind of fig you desired. We had white figs, green figs -- what can I tell you? We had many types of grapes, al-qassoufi, al-maqsaas, al-helwani, because I tell you we had every thing called grape. Our olives were tasty, our figs were good. Here there’s a saying that olives from the south are good when they grow in the wild, meaning that olives that don’t get water are different [better than] from olives that do. Q: What would you call olives that receive water? A: They are called irrigated olives. The other ones are ba’l olives. Q: When someone wanted to build a house, would he build it by himself or his family help him? A: No, no, he wouldn’t build. A builder would come to us. Most of them were from Safed. In the time of our grandparents, houses were built from rock and stone, and in the time of our grandparents’ grandparents. And every year they would put clay on the house, and the yard and everything. In our time the builder would come from Safed and cut stones from empty land. The workers would work on them for the building, and build the house, and mix cement [for the roof]. Every young woman and young man would help carry cement for the roof. Like now they bring people from Hawran to help put the cement, with us it was the young women and men who put the cement. The young men worked and the women carried [materials] on their heads, and cooked food for the people who were helping the building. Like you go to help during the harvesting season and and gain food supplies. And those who don’t have olives go to help, and get supplies. This was how people were in Palestine; the neighbors knew each other by smell, brothers. Is there this today? No, it is lost. Hamdillah. Q: From your words it seems you in the village used to love each other? A: The whole village loved each other. If you had a wedding many people from outside came. If there was any problem they would solve it. Q: I wanted to ask you, when there was a problem, did the mukhtar come? A: Yes, the mukhtar and the elders would come, and they were honoured. God rest his soul, my uncle from the Jisheh family, many young men would come to him from the house of Jisheh and from al-Kabri, because they saw each other as one big family. If a notable stood up in the village square, and there was a problem among the men, the notable would say “Yallah! Yallah! Yallah! to the house!” Would anyone dare oppose him? The young people would talk, but the notable man’s word was obeyed. As the women who were older than us – if they didn’t permit us, we didn’t go out. If we wanted to go to a wedding we could go if they allowed us, but if they didn’t allow us, no. Does any of this exist today? A: We lost all the heritage of Palestine. Q: Was there revenge? I mean if someone killed someone would they take vengeance? A: Yes there was, there was. There were people who killed one another. But not with us, not in our village, not once, not that I was aware of. I only know of the battles with the Jews where many (Arabs) were killed. But I don’t remember their names. Q: Why was there a battle with the Jews? A: The battle was between the Jews of Nahariya near ‘Akka and an area close to Tarshiha. A: Yes the Jews, they built settlements, may God destroy those who sold their land to them. They bought land in Tarshiha and built a quarter called Jedeen. They bought land in al-Bassa and built a quarter called Hanuna. Near ‘Akka they called it Nahariya. We had doctors who would go to Tarshiha on horseback, as well as to al-Ghabsiya and al-Kabri. Q: Oh so there were doctors? A: Yes, there were. Unlike today, when every body has a car, they would ride on horseback. But we also used to go to Jewish doctors for treatment. There was a doctor named Mariam… She was a women’s doctor, I mean [she treated] the health of men as well as women. When the Jews wanted to take the entire village, the people of the village got ahead of them by going to Jedeen and making barricades of stones on the streets. They burned the first armored car as it went through the first barricade, they overtook it, the shabab killed them all. We in al-Kabri had a big battle, I mean people came from Tarshiha [to fight]. Q: Which battle was that? What was it called? A: It was called the battle of al-Kabri. The battle was in our village. Ahmad Hassan, may God have mercy on him, was killed in it. Muhammad al-Nahfawi, Rashid al-Nasser, and al-Haj Darwish were killed too. I’m remembering them, they were killed. The Jews shot them. When the Sarhan family came, the Jews placed a explosive, and where did it explode? Not in the building but on a side where the bathrooms were. Rashid al-Nasser and his wife were killed there. That is how the battle of al-Kabri began. Q: Did they sing for them, something to encourage them, during the battle? A: For the shabab? No, wallahi, they didn’t. During the battle, the situation was impossible, and later the American army came and collected the dead. They lost about 95 Jews. Q: Alright. Did you sell the olives and the figs that you picked outside [the village]? Or did you go to Kwaykat market, or what? A: In Kwaykat, anyone who wanted to sell a camel, lambs, or anything, would go to Safed market, walking. For example, if we wanted to grind the wheat, where would we go? We went to Ra’i. If we wanted to make semolina, where did we go? to ‘Amqa. I mean the ‘Akka tram belonged to someone from ‘Akka, we would load the goods on it, and we would go there and grind it -- for example, anyone who wanted to sell wheat -- and people bought from one another. Q: Where did you buy your lambs and cows and such from? A: We knew where to buy them. For example, lets suppose you have ten female goats and a male goat. The ten give birth to twenty, and the twenty also give birth. There are people who have 500 or 600 heads. A herd would equal a shala’ of goats as we would call it. Q: What is a shala? A: It means a large amount. If someone possesses 500 heads, what would he call it? He would call it a herd of goats. All animals give birth. The camel gives birth, the beast of burden gives birth – all of them. Q: In your village did they sell gold and jewelry? A: No, in our village there wasn’t any. We would go buy from ‘Akka, from Elias al-Toubi. We would buy everything for the bride. We would buy from Hankaz in the old market. All the bride’s trousseau was from ‘Akka. Within the province of Galilee, such as in al-Ghabsiya, gold would be sold. From al-Kabri, al-Zeeb, al-Bassa, all would go to ‘Akka [for jewelry and gold]. Q: The circumcision of the child, hajji? A: That also had its own celebration. Q: What would they sing for them? A: They would celebrate. I don’t remember exactly [what they would sing]. I was only 16 years old. We have forgotten most of those things. Q: What would they do for a boy’s circumcision? Would they invite people, or what? A: Yes, they would invite relatives. And when the relatives sang, the people would hear. When the bride was getting married, al-barbaky would come, the person who was specialized in this work. People come and clap for the bride and groom, and money also would be given. Q: What about your guests, hajji? When a stranger came to your house, how did you treat him? A: You invite, you cook. Q: What was it customary to do? To slaughter an animal, or what? A: Yes, they would slaughter an animal if the guest was dear to them, not for any guest. Q: Was there a house for guests in villages in Palestine, or mosques with a special room for guests, or a guest saloon? A: What we knew was that the mosque was a place to pray in, a place for prayer. The land was large, and anyone with means could build a guest house. This place was called a mudiyafi - it had a room for women and a room for men. A: Ramadan was magnificent. When Ramadan came, what did we do? Everything in the end was for Ramadan. Lebneh and cheese, and all of God’s riches. You see, my daughter, it was all made from the land. During Ramadan, we kneaded and mixed the dough, just as now we buy this vermicelli. Ten or fifteen people would be invited from the neighborhood, here in the square of the Jisheh family. All would come, young or old that day, the day of mixing. And the following day we would visit a different household, each day a different one until the month was finished suhoor. Rice and vermicelli with cows’ leban. Q: What were you eating for the suhoor? A: How beautiful was the suhoor! The food wasn’t too sweet. We would make ka’k. There was a day for cakes with you, the next day with your sister, the next with your maternal aunts, the day after with your paternal aunts, and with your neighbors. Every day with a different person. Not like today when they serve a small bit like this! It would be on a large copper tray and people stayed eating the ka’k all month. Where do you find this today, where? Q: Was there someone who woke up the people for suhoor? A: There was someone, and the call to prayer, and everything. Q: Did you decorate the neighborhood and the area? A: No, Ramadan would come and would be welcomed, Ramadan was like a celebration at night. But decorating the neighborhood, no. Q: Did you have a hospital in the village? A: No, those who were ill were taken to ‘Akka or Haifa. The major hospital for the ill was in Haifa. ‘Akka didn’t have a hospital, it had doctors, and the doctors would move between ‘Akka and Haifa. In all our area there were no hospitals, they were all in Haifa. Q: When you were visiting the sick, what would you say to them? A: May your health be good. We would greet him, and ask what he needs, may God heal you, and have compassion on you, and bless you. We don’t say things like that today. Q: Did you take something with you? A: Yes of course. Visiting the sick is halal. Q: Did you have younger siblings? A: I had a younger brother and an older brother and sister. Q: Would you read stories to your younger brother? Q: Did your brother read you stories before sleeping? A: We would talk a lot. Our elders would come and tell us stories as well, if we wanted to stay up late. An old woman would sit with us and tell us stories. Some stories were scary. Our older brother Abu Kamel, God have mercy on his soul, would lie on the ground and play Kharj al-Malaaha. Q: What is Kharj Al-Malaaha? A: He would lie on the ground and you two others would make a web with your hands, and we would twirl around him. A: Yes there was sea next to al-Zeeb and Nahariya. Q: Did you go down to the sea? A: Yes, they would take the camels to wash them in the sea. There was also sea at ‘Akka. My aunt, God have mercy on her soul, lived near the sea near ‘Akka. Q: What did your father, God have mercy on him, do for a living, hajji, farming? A: We had lands, figs, olives, grapes, camels, and towards the end we owned an oven. Women used to bake things in it, they would come from ‘Akka and al-Kabri. Q: Did you have anyone who worked with the army? A: Yes, there were young men who were employees of the army. But not many. Q: Did they talk about what happened to them in the army? A: No I didn’t hear anything from the young men. Q: Was the mukhtar influential in the neighborhood? A: The mukhtar? The Americans (may God destroy them) would come riding horses, and tie their horses to the mukhtar’s gate and enter his home. They would from come from ‘Akka to vaccinate children. You would take your brothers and sisters or your children to be vaccinated at the mukhtar’s house. There weren’t vaccination centres like now. Q: Did they take taxes? A: Yes, if you owned goats, they would take for them. If you had a piece of land, they would take for it. Every year. Q: Every year they’d come to take [taxes]? Okay, when it didn’t rain, did they have something called ‘al-Ghayth’? A: They would say: “Yalla al-ghayth, oh eternal one, rain on your sleeping plants”. They would carry [musical] pipes and ask God for rain. Q: Were there people who would go to the mosque and pray and ask God for rain? A: Yes, they would ask. Q: And when there was a lunar eclipse? A: All this was part of what we had in Palestine, religion and faith. I mean when someone went on the hajj, people would say that so-and-so has performed the hajj, and when he swears on his right hand -- because he made the hajj, they say he is more honest [ie. believe him]. Now people don’t know how to call on God, or say thank God. The phrase “glorified is God” used to be said by everyone --“glory to God the most high, glorified is God the most high”, and then it would start to rain. Now when it rains, where do you hear people thanking God and saying “there is no god but Allah”? Back then people believed in everything. Say these things now to the youth! Q: Did you study religion like us? Did you gather together, and someone came to give you lessons in religion? A: I’ll tell you about it. For example, a girl’s family would educate her about religious matters, sometimes four or five teachers would teach her. The young men I told you about you, they would complete the Quran, And anyone who wanted to learn a lot would go to ‘Akka. The cleverest would go to ‘Akka, if he wanted to be an engineer or something that we didn’t have in Kabri. No, they couldn’t finish their education in al-Kabri and in the villages. Q: Did you commemorate Thursday of the Dead? A: Yes of course we had Thursday of the Dead. We would boil red and yellow eggs. A: What shall I tell you? You will laugh at me. You take an onion with red skin, you boil it, and put it with the eggs, and the eggs come out red, red! Nowadays, during the Thursday of the Dead, they boil yellow flowers with the eggs, and they come out yellow, yellow! How much fun we had! The eggs stay in the baskets. You would enjoy yourself cracking the eggs. A: This was a tradition of ours, to come and crack eggs to see who had the stronger egg. Q: Were there Jews and Christians in the village? A: No, there weren’t any Jews or Christians. We were all Muslims. In Tarshiha there were Christians and in al-Bassa there were Christians. Q: Did they [Muslims and Christians] get along with each other, or did they have problems? Q: Did women sit together? A: Every household had a story. The women of the quarter would sit together in the afternoon when they had finished work and laugh together. Q: Didn’t they finish their work in the morning? A: In the morning there was no sitting down. It was just work. Q: Was there fishing in your village? A: Of course. There was fishing and hunting for birds. There were hunting guns and it was permitted. It was forbidden without a permit. We all used to sing, “The shabab have gone to out to fish, and the name of the hunter is written on the rifle”. Q: If someone wanted to migrate and go to a different area? Or did this never happen? A: In our days no one left the village. When I was newly born, an uncle of mine went to America and he never returned. It was the same with my husband’s uncle, God have mercy on him. Q: How did they leave? A: On a ship. Besides my husband’s uncle, my husband’s aunt Um Aziz and four or five others also traveled to America and didn’t return. Q: When you left Palestine, did you come straight here to Bourj al-Barajneh, or where did you go? A: We left at the time of the Nakba. My husband was the only boy among nine girls, and I was newly married at the age of thirteen and a half, and I left with a child in my arms when the battle took place in our village. They faced them with rifles. Our weapons were very, very light. When the battle happened, they expelled us to Yareen [South Lebanon]. A: Yareen is on the border where al-Naqura is, near by. That time we went to Yareen and Fatima’s Gate. We took a few cows with us -- we took the cows that walked with us. And my husband remained in al-Kabri, even though he was the only boy among girls, resisting with the young men until the Jews entered the village. What could the rifle do against those who came? They went from al-Kabri to al-Ghabisiya, and from al-Ghabsiya to Yarka, and from Yarka to Tarshiha. Q: And you, after Yareen, where did you go? A: From Yareen we came to Madfineh. A: Madfineh was where Sayyed Abdallah had property, near Rashidiya camp. We arrived and took [ie. rented] land, and began to plant cucumbers at Jal al-Bahar. Q: Did anyone help you? UNRWA, for example, didn’t it give you aid? A: No, there wasn’t any aid when we first left. A: Later UNRWA went around looking for wherever there were refugees to register them, and gave us rations. We left Madfineh for an area called Abu al-Aswad, on the road to Tyre, the place where the Lebanese army and Amal movement are now. We took [ie rented] a house from Beit Muhammad and 120 dunams of land, already planted with wheat. We started to grow eggplant, tomatoes, cucumbers, courgettes, and whatever you could grow of vegetables. Thank God, we finally reached Beirut because in the end we got tired of it. We grew bananas too, and the land was for Muhammad Tamer. We grew and picked. Everything we grew was for us and for him. Finally we came to Beirut. And it was running and running, and supper was khobayzeh. Q: Hajji, did you use to put on makeup? Q: What would you put? A: We put that powder that has a sweet smell, yes, a little like this. Not every girl would dare to put on makeup, and not every family would allow it. But now girls go out to weddings and pluck their eyebrows. For us then if a girl plucked her eyebrows it was considered shameful. Once she was married she was free to do as she chose, whether her husband allowed her or not. Only while she was with her family, it was forbidden. Now women in the neighborhood are always smoking cigarettes or the argileh. I seek refuge in God. We didn’t have that in the village, no! Q: Is there anything else, hajji, that you would like to tell me? A: I told you everything we had, and God bless you. ا: ام صالح شاكر حطي, هو الجشي بس احنا لغينا الجشي, حطي شاكر, وقت الي طلع الاحصاء قالولا لمرت عمي شو اسم جوزك قالت لهم ابو صالح شاكر, حطت اسمو و اسم ابوه و احنا من بيت الجشي ما حططت اسم العائلة, خلص ضلينا شاكر. ا: يعني كل البلد تنجمع في هذه الساحة و يعملو هالسهرة, كنا احنا نقول لهم التعليلي, المهم يوم العرس شو بدي اقولك, يعني بدنا نجمل التراث كله اللي كنا نمشي فيه يوم العرس قبل بيوم يمرؤوا على البيوت يعني انت عندك حملة حطب بدك تحمليها و توديهم لدار العريس يعني بيعزموا المعازيم, كل معزوم بدو يجي بيجيب دبيحة او شوال رز او بيجيب شوال قهوة. ا: او كيس سكر يعني يوم العرس بيعملو بالهالعرس بيرموا بها العرس شو بدي اقولك احنا عنا ببلدنا بيجو بالاول بيطلعو على بيادر الشراقة, بيادر واسعة بتطلعي عليها بتعملي دبكة و السحجة و الرقص و كل شي, بينزلو منها لتحت الزتون, ساحة واسعة كمان نفس الشي نفس البرنامج بيطلعوا عدار عاطف يعني هادول جار الزعما, عجار سرحان من جار سرحان بينزلو عزاوية من الزواية بينزلو على ساحة بيكونو عاملين هالحبال و هالاناديل و الاناديل كانو يعملوها و يضوو بالسهرة و طول يجطو هالحبال و هالاناديل, بيتجيبوا هالحاداي ابو السعود بيجو منشان يعتبوا بالسحجة و الناس بتزقف وراهن. ا: و الله وين يودوها عند دار العريس تلحقها الناس و يركبوها عالفرس. ا: عالفرس و عند ام العريس فستان هدول مخليتن من فستان العرس و بحطوه على الفرس و بيركبو العريس و لكا يطوف العريس عديال البلد و لما يطوف عديال البلد بركبوه على الخيل و بيحطوا فستان امه و لما يجيبوا العروس كمان عند دار عمها كمان نفس الشي. ا: ايه نفس الشي و بيقوللها " هاي كبيرة بنت كبار بدي سحجة باب كبار و المجيدة ما بتفوت الا بدينارين كبار"
ا: العيدين عنا نفس الشي, يعني بتعمل الناس كعك. ا: كعك براحة و جوز و سمسم و بتعملي بتمر كمان بكل بيت مش ممكن الا بنهار العيد. عيد الصغير و عيد الكبير لازم ينعمل 40 خميس الاموات لا هون هني كانت النسوان كمان تطبخ و كل شي و تحمل عروسها و توزع عالتربة و توزع عالفقرا و اشي يذبح ذبايح و شي يعمل اكل يعني الحمدالله كانت الخيرات بفلسطين كتير حلوي. ا: نعيّد عبعضنا يعني بالمثل بيقولو صول صلاة العيد و بيوجه على كل من عنده ولية يزورها واجب على كل واحد هوي و ولاده يعيّد على اخته يعيّد على عماته و خلاته و يعيّد على اصحابه, هاد العيد عنا يعني نطلع احنا البنات نعمل كبة بنات و احنا صغار. ا: و هني المتجوزين كانو يتعنزقزا و الصبايا الكبار كانو يتعنزقوا, يعني كيف يتعنزقوا, يعني عاملين عنزاقة مش مع الشباب يعني هون في الزنزلختي, ما بتعرفيها, هون في شجرة و هون في شجرة, يعملو عليها حبال و يعلقوا المراجيح. ا: يوووو, دبايح و دبايح متل اسه هيك بيعملو اكل يعني اقل عرس بيدبحوا 10- 15 دبيحة لانه بتنعزم, يعني عنا الكابري و بدا تنعزم ترشيحا و كويكات و الغابسية و النهر و البصرة و الزيت و مش بس احنا الكابري كل من بدو يعمل عرس بيعزم كل القرى الي حواليه و شوفي لما بتيجي كل هالمعازيم. ا: السحجة لما يقعد الحدة يعتب بتلاقي الشباب يلا بتزقف و الحدة يعاتبون و هن بيصيروا ينطو نط و بتنزل ام العريس بها الساحة و خالتو و قرابته و يحطو احنا كان عنا المغرفة الخشب بيقوللها هلاء و تنزل ام العريس بالمغرفة بالسحجة. ا: كانوا يطلعو عالجمال يحجوا يعني الحج اللو شغلات صعبة كتير, عالجمال كانو يروحو و كانو يتعوقوا كتير الحجاج. ن: شو بدنا ناخدلو قهوة هيك كيف اسه يعني قهوة, سكر, رز, حتى كان الرز الو قيمة زمان, على ايامه احنا كان الو قيمة الرز يعني بالمثل كنا ناخد رطلين رز, بالرطل ناخد. ايه 2, 3, 4 رطال يعني اللي ماخد رز حتى غير, و اللي ماخد قهوة مش مثل اسه بيحملوه هيك بإيدن لا, بياخدوا كيس القهوة يعني قهوة نية, بياخدوها بس بدن يزوروا مريض و اللي بدو يروح على العرس كمان بياخدوا كياس القهوة كمان. ا: الحمدالله كان عنا ارض, كان عنا كروم كان عنا زتون. احنا احنا. انا الي شايفتيني كنت اطلع عالكرم و انا بنت 12 سنة كنت اكلع عالكرم احوش الكرم و احطوا على راسي و سلة العنب بإيدي كان عنا بفلسطين بنت 8 – 9 سنين ما بيقعدوا بالبيت ما في عنا بنت تقعد بالبيت. ا: بالحليجة كان الزلام و النسوان و بالحصيدة النسوان و الزلام يعني الزلام تحلج بالاخواف, فيه احوق هيك كبير بتحلج و ببكوم و النسوان بضب الغمار, يبقى الشباب بتحلج و بتحط الغمار و النسوان بضب الغمار و بيحملهن و بيحطوهن اشتات اشتات, انا اللي عم بحكيكي كان عنا جمال, يعني يروج ابوي يحمل عالجمال يروح التاني و يروح التاني مش بس واحد عندو جمال, كيف اللي عنده اسه سيارة شحن يعني بياخد عليا نقلات. ا: مش بس احنا كتير في بالبلد جمال يعني بايام الحصيدة عالجمال, و ايام الحطب, بالايام يحطبو اشي يحمل على راسه و اشي عالجمال يعني بالمثل بدنا, نقطف البردقنات نودي منه على صفد و نودي عترشيحا نودي نقلة على سوق كويكات يعني مطرح ما فيه سوق عرفت كيف. ن: انتو بالكابري ما كان عنكو سوق توزعوا تشتروا و تبيعوا فيه. ا: احنا كان عنا بالكابري اللي عندو بالارض هيك تين و عنب و هيل و طعمي جاري, انا عندي بطعمي جاري الله يرحموا ابوي انا و صغيري كان يقولي يابا بس تحوشي التين و تحملي اللجن عراسك لمين ما تمرئي بتقولي تفضلوا, اللي بتاكل من الله يبارك فيه هاد بعدني بذكروا هاللحكي القديم يعني, شايفة اسه اليوم بتروح بنشتري كيلو هالعنب بإيدنا نحطوا بالكيس و بتمشي. زمان يحطو بالسلة, و باللجن عراسنا, و السلة بإيدنا اسه اليوم مت فيه منه, وين يعني اسه كل ما نقعد بتقول الله يحرمك يا اسرائيل مثل حررمتينا هلأ ملاك. ا: مش عارفة بقولك الارض و احنا صغار في الدرميهمة ما بتعرفوها و في القصصية ما بتعرفوها و فيه الديناري ما بتعرفوها وفي الخورفيش ما بتعرفوها هاد كله دوا احنا كنا نقلعوا من الارض و ناكلو هاد كله دوا, هلأ تطلعي باللي طالعين من فلسطين الكبار شوفي بشرتهن نضرتهن يعني اسه انا مرا كبيرة بشتغل اكثر من كنايني ليه؟ لانه نابتين عغذا مش اسه كله كيماوي بتروحي بتشتري ضمة بقدونس بكون الها ريحة , فش منه, بتقطفي عن الشجرة و بتكلي بالمثل عندك تين انت, تنطري هالبنات و الصبايا و تطلعو تقطفو الكروم و الله تقطفي اللي بدك ياه, بتقطفي هالعنب بتكليها كوز التين اللي بدك ياه بتكليه فيه التين البياض فيه, التين الاخضاري شو بدي اقولك العنب في القصوفي فيه المقصاص في الحلواني منشان اقولك شو فيه اسماء العنب الي كانت عنا الزتون كان زاكي التين كان زاكي يعني هون فيه بالمثل زتون الجنوب يعني ماخد منيح بالزتون الي طالع برا يعني اللي ما بشرب مي ريحتو غير اللي بيشرب مي. ا: لا, لا, ما كانش هو يعمر, كان يجو المعمرجي عنا اغلبن يجو من صفد. يعني قبل عزمان جدودنا كان اللي معمر بيت, بيت حجري صخري يعني انه شو هادا و عزمان جدود جدودنا كل سنة بطينو البيت و الدار و كل شي و عزمانا احنا كانو يجوا المعمرجيّ من صفد, يقطعوا السوار من الوعر و الشغيلة تضبطو منشان العمار و يعمروا البيت و صب الباطون, فش انه من اهل البلد حدا يستأجر لا, كل الصبايا والشباب هي تزؤ بالصبة, كيف اسه بيجيبوا الحوارني يجو يصبوها, كان عنا الصبايا و الشباب يجو يصبوها, الشباب تشتغل و النسوان تحمل على روسها و يطبخو و يعملو اكل. شي للناس اللي عما تساعد مثل انت بالحصيدة يروح يساعد و يطلع مونته واللي ما عنده زتون يروح يساعد و يطلع مونته و هيك كانت الناس بفلسطين يعني بدك تقولي الجيران عريحة الريحة اخوة, اسه اليوم فيه من هادا؟ لا فقدناه كله الحمدالله. ا: كانت كثير البلاد تحب بعضها يعني اذا يوك العرس اجت ناس من برا عملت اي اشكال يحلوها. ا: فيه, فيه كانت ناس تسير يقتلو بعض بس عنا في بلدنا ما صارت ولا مرة, يعني انا ما وعيت لها, ما واعية غير معركة اليهود هني كتار اللي نقتلوا فيها بس اساميهن ما ذاكرتن. ا: صارت المعركة بين اليهود بالنهرية حد عكا و فيه منطقة حد ترشيحا. ا: آه, اليهود عملوا مستعمرات, الله يهدن الي باعوا اراضيهن يعني اشتروا ارض بترشيحا عمروا فيها منطقة اسمها جدين اشتروا عالبصتة عمروا مستعمرة اسمها حانونة حد عكا سموها نهرية يعني احنا في النا دكاترة يطلعوا عالخيل يحكموا بترشيحا و الغابسية و الكابري. ا: اسمها معركة الكابري, صارت المعركة عنا بالكابري نقتل فيها احمد حسن الله يرحمو و محمد النحفاوي و نقتل رشيد الناصر و الحج درويش يعني اللي دايرس بالي انن نقتلوا, يعني اليهود كانت تطخ, اجوا دار سرحان اليهود حطوا اللغم و اللغم وين اجا؟ ما اجا بالبناي اجا بالناحة الي فيها الحمامات نقتل رشيد الناصر و مرته عشان هيك صارت معركة الكابري. ا: للشباب؟ لا والله ما كان. وقت المعركة كانت حالي و بعدين اجا الجيش الاميركاني سحب كل اللي انقتلوا راحلن شي 95 يهودي. ا: بكويكات الي بدو يبيع جمل, خروف او اي شي بتروحي عسوق صفد بتروحي مشي, يعني بالمثل بدنا نطحن وين بنروح بالريس, او بدنا نعمل سميدة وين بنروح على عمقة, يعني كان البابور للعكاوي يعمقة نحمّل الادوات و نروح نطحن واللي بدو يبيع مثل قمح يعني الناس تشتري من بعضها يما. ا: احنا منعرف من وين شتروها. احنا منعرف انت عندك لنفترض عندك 10 سخول و معزة , العشرة خلفوا صاروا 20 و العشرين خلفوا صاروا فيه ناس عندها 500 راس و 600 راس يعني شلعة, شلعة معزة منقولها. ا: رمضان كريم, اسه بدو يجي رمضان شو احنا كان عنا يعني بنهيئ كل شي لرمضان, اللبنة و الجبنة يعني خيرات الله كثير يا بنتي شايفة كله من الارض بتعمليه, برمضان بدنا نعجن و نفتل كيف اسه منشتري شعيرية هاد, ايه ينعزموا 10 – 15 وحدة بالحي مثل هون ساحة دار الجشي الكل بدو يجي الصبية و الكبيرة يوم الفتل عنا بكرا الفتل, اليوم التاني عند فلاني, يوم التاني عند فلاني ليخلص الشهر كل يوم عالصحور بيقوموا و يفلفلوا رز مع شعيرية مع لبن بقر. ا: لا يعني اجه رمضان يا مرحبا بابك يا رمضان يعني بالسهرة هيك آه, بس زينة بالحارة لاء. ا: لا اللي بيمرض كانو يخدوه على عكا و يخدوه على حيفا, كان فيها حيف المستشفى الرئيسي للمريض, بعكا ما كان مستشفى كان فيه دكاترة, الدكتور يحول من عكا على حيفا, عنا المناطق هيدي كلياتا ما كان فيه مستشفيات كله كان على حيفا. ا: سلامتك, نسلم عليه و نطلع شو بدك تقوله, سلامة قلبك الله يشفيك و يعافيك مثل ما بنقول اسه. ا: ايه معلوم, زيارة المريض حلال. ا: كنا نحكي حكاية احنا يجوا الكبار يحكولنا حكاية لما بدنا نسهر بالسهرة تيجي المرة الكبيرة تقعد تحكيلنا حكاية, في حكاية بتخوف و هيك, و يقعد اخونا الكبير ابو كامل الله يرحمه يتبطح بالارض يلعب خرج الملاحة. ا: ايه كان فيه بحر بلزق الزيب بلزق النهرية. ا: آه, الجمال كانو ينزلوها يغسلوها بالبحر, فيه بحر بعكا, الله يرحمها عمتي كانت قاعدي بلزق البحر بعكا. ا: المختار كانت تجي الاميركان ( الله يهدن) يجو على الخيل يربطوا الخيل على باب المختار و يفوتو عنده, كانو يطعمو للولاد من عكا و يعني اليوم في تطعيم ايه انت بتاخدي اخواتك او ولادك على التطعيم عند دار المختار ما كان فيه اسه مثل هون مراكز تطعيم. ا: كانو يقولوا " يلا الغيث يا دايم اسقي زرعك النايم" كان يطلعو او يحملو الناي و يطلبوا من الله كرمال تشتي الدنيا. ا: لقولك شو الي كان بالمثل البنت اهلها معلمينها تقعد هيك مع اربعة خمسة بتحكي قدامهن شو فيه و الشباب قولتك كانوا يختموا القرآن و اللي بدو يتعلم كتير كانو ينزلو على عكا يعني الاوائل ينزلو على عكا, يعني اللي بدو يطلع مهندس بدو يطلع هيك مش عنا بالكابري لا بالكابري ما الو علم يكفيه بالقرى ما كان في هيك. ا: ايوه خميس الاموات الاّ, نسلق هالبيض الاحمر و الاصفر. ا: شو بدي اقولك رح تضحكو عليّ, يعني يعني يكون عندك بصل ورقتها حمرا تغليها و تحطي معها البيض شو تطلع حمرا حمرا, هلاء بهاي بايام خميس الاموات كان فيه هادا الورد الاصفر كمان تغليه مع البيض تطلع صفرا صفرا, و شو نفرح فيه و الشباب تبقى بالسلال معاهن البيض و يفقسوه. ا: هادا كان تراث عنا, تعالو نفقس بالبيض مين اللي معه بيض اقوى. ا: لا ما كان فيه عنا يهود و لا مسيحية, كلنا اسلام بترشيحا كان فيه مسيحية و بالبسطة كان فيه مسيحية. ا: الاّ, فيه صيد سمك و عصافير فيه, جفوتي مرخصة مش بدون ترخيص, كله ممنوع بدون ترخيص, و كلنا نغنيلها كمان طلعت الشباب تتصيد و اسم الصيادة على الجفت مأيّد. ا: احنا على ايامنا ما حدا هاجر, في اللي انا لما كنت خلقانة جديد الي خال راح على اميركا و ما عاد رجع . فيه الله يرحمو عمو لجوزي. ا: بالباخرة, فيه عمو لجوزي كمان في خالتو ام عزيز في 4-5 سافروا على اميركا و ما رجعوا. ا: نحنا طلعنا وقت النكبة, كان جوزي وحداني بين 9 بنات و انا كنت متجوزي جديد بنت 13 سنة و نصف و طلعت على ايدي ولد لما صار معركة عنا بالبلد, كان يصدوهن عالبارودة انه كان في سلاح خفيف خفيف لما صارت المعركة طلعونا على " يارين"
ا: " يارين" تجي على الحدود وين الناقورة, حد الناقورة, هديك المرة طلعنا على يارين و بوابة فاطمة. آه, و طلّعنا شوية بقر, البقر الي بتمشي معانا طلعاناها, ظل جوزي بالكابري و هو وحيد بين بنات و بقي شباب و ظلن يقاومو حتى فاتت اليهود على البلد بس فاتت خلص شو البارودي بدها تقاوم هادول اللي جايين طلعوا من الكابري عالغابسية و من الغابسية طلعوا على يركا, و من يركا طلعوا على ترشيحا. ا: من بعد يارين اجينا " عمدفنة "
ا: لا ما كان في مساعدات هيك اول ما طلعنا. ا: بعدين الاونروا صارت تدور وين فيه لاجئين و تبرم و تسجل و صاروا يعطونا اعاشات و طلعنا من المدفنة لمنطقة بقوللها ابو الاسود و انت رايحة عصور فيه منطقة بقوللها ابو الاسود, محل ما في جيش اللبناني و حركة أمل و اخذنا عند بيت محمد 120 دنم, صرنا نزرع و اخذناها مزروعة قمح و صرنا نزرعها باثنجان و بندورة و خيار و كوسى و شو ما بينزع خضار و الحمدالله و صلنا عبيروت اخر شي ملينا, زرعنا الموز و كانت الارض لمحمد تامر نزرع و نقلع و اللي يطلعنا النا و الو بس اخر شي اجينا اعدنا هون ببيروت و صرنا نركض نركض و العشا خبيزة. ا: كنا نحط من هاد البودرة الي الها ريحة حلوة, آه نتفة هيك, و مش كل البنات تسترجي تحط و مش كل الاهالي تقبل, لكن اسه البنت بتطلع العروس بتعمل حواجبها, احنا عنا البنت تقيم حواجبها و هي بنت عيب, بس تتجوز هي حرة اذا جوزها بخليها او لا, بس عند اهلها ممنوع متل اسه نسوان بالحارة تبقى حلملة السيجارة و الاركيلة اعوذ بالله ما كانت عنا بالقرى لا. ا: اللي عندنا قولناه و بارك الله فيكي. ا: اه الساكو, هاتي القميص متل اسه البنطلون احنا عنا كان الشروال. The mandeel was edged with small coloured bundles of crochet work called oyya. A conventional way of starting to talk about something. Ta’leeli means preparation, but is only used for wedding preparations. The sahra is the evening celebration of a marriage. Elders and notables would receive formal invitations to weddings, but young people and fellow villagers would come uninvited. The sahja was a special dance for weddings that included clapping and drumming. Yu’atab/’ataba is a special kind of singing that can be sad or happy depending on the occasion. It is common to the Mashreq area. The shamleh was a long shirt without buttons, the shawal were baggy trousers. A Palestinian and Lebanese saying. For oyya see fn 21. Ratl, artal: a measure of eight, not used today. We could not find English equivalents for these herbs. Anything grown ba’l, ie. through rain alone, is prized for its better taste. The word is related to the Canaanite god, Baal. Arihat al-riha, a saying to express extreme closeness of relationship. An example of confusing the oppressors. Halal actions are good, the Quran encourages them. Wadi Zeini: an area north of Sidon where displaced Palestinians have built and rented homes. This is a phrase conventionally used with the name of an oppressor. As before Um Saleh confuses British and Americans. An old term for taxes. Al-ghayth, the provider, a term for God, though the correct term is al-mughayth. The word yufaqsu, cracking, is also used for hatching eggs in Arabic. This pleasant habit continued in camps. Women who moved out to multi-story housing missed these relaxing sessions. Jifit was the word for a hunting gun. 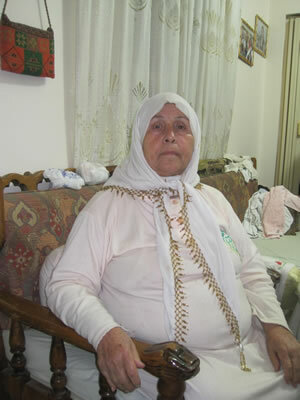 At the beginning of the interview Um Saleh says she left Palestine at the age of 16, with an infant in her arms. It seems unlikely that she could have had a baby at the age of 13, even if she had married at that age. The detail of her memories also suggest that she must have been more than 13 when she left. Fatima’s Gate is one of the crossing points between Palestine and Lebanon. It still exists today. Probably Um Saleh is referring here back to the life in Madfineh that they got tired of. My name is Muhammad Abdul-Fattah al-Moghrabi. I was 13 years old when I left Palestine. My occupation was in construction, building. My father’s work was in fishing, he had a small boat. Work was slow, just a little bit during the day, but the essential fishing was done at night, as well as going to sell the fish. As for farming, citrus fruits like oranges and tangerines were well-known, also vegetables. It was the cleanest produce, and the land was good. There was a wooded area in ‘Akka that had swings. There were places for hiring donkeys, and they [the children] used to go and play at ‘Napoleon’s Hill’. ‘Akka is a heritage city, with the sea and ancient sites. The hajj: The pilgrims would meet near the railroad station, and then head for Haifa where they would gather with the rest of the people making the pilgrimage, and then take a ship – air-planes were few in those days. Funeral customs were the same as here. We have the third day, the week, and the fortieth day. They would offer food and slaughtered sheep, and the neighbors would cook, and clean the house. They would help the family of the deceased as well as the poor, and there were donations of food, supplies and money made to the family of the dead person. Revenge: This was the custom of the peasants, and they would judge themselves. As for the distribution of our produce, we had a vegetable market and there was a wholesale market there. The peasant would come with his goods and would sell them there. There was also an auction. They used to buy cows, donkeys, and chickens from the animal market, and horses from special markets. ‘Akka had many stores for gold, jewelry, and cakes. In ‘Akka, there were Muslims, Christians, and Jews spread out together, and there was also an area called the ‘Jewish quarter’. They all got along together. In fact my grandfather was suckled by a Jewish woman called Um Haroun. The eastern Jews were already living in Palestine, and had the same customs and traditions as [the people of] Palestine. However, the western Jews who came from Europe were racist, and there began to be problems between those Jews and the Muslims. In those days Christians used to inform to the British army about Palestinians. All the Muslims were Sunni, and they used to call the Christian Nazarenes. They used to buy cloth from the shops and make sweaters, trousers, and sandals for the feasts. Visiting the sick: We used to take sweets and fruits with us. Most of the hospitals were in Haifa, and there were many hospitals in ‘Akka as well, and large ones. It was forbidden to speak about politics and the Arab resistance, those who did were arrested. Everyone who spoke of nationalism was imprisoned, beaten and tortured to make him speak about his followers and his life. Ramadan: My grandfather used to fast. We used to decorate the quarter and have celebrations at night, and everyone would go to pray the evening prayer in the mosque. Ramadan was nicer [in Palestine] than here [Lebanon], for the neighbors and the quarter used to invite each other, and prepare large meals. And there was aid given in secret from everyone. There were many buildings and much construction. There was a mukhtar to handle administration and solve the problems of the town, and if he was unable to solve a problem he would pass it on to the government. But all problems were resolved peacefully. There was a revolution against colonialism, and there were arms, but the arms were hidden, and so was Rushdi Al-Sa’di, one of the revolution’s leaders, who was exiled by the colonialists. There were demonstrations that included women and men. Al-Haj al-Husseini, al-Amin al-Husseini, was the leader. Our traditions were beautiful. Everyone in the quarter knew each other, everyone, even the children. Emigration and travel: My uncle Abdul-Salam was in the British army. He went to Egypt by ship to work. They used to tell children stories but I don’t remember them. Winter: We used to listen to the dropping of the raindrops and we would say --- but ‘Akka had plenty of water and springs, and we were never short of water. The lunar eclipse: We would glorify and praise God in the mosque. And there was folklore about boiling eggs when there was an eclipse, and people would go the mosques -- there were many mosques. Towards the end, there was a microphone. And they would fire the cannon at the time of the call to prayer from the walls of ‘Akka. There were gatherings for women where they talked about marriage, weddings, and food – gossiping -- and the children would amuse themselves with food and games. There was adherence to religion. All women were veiled except for the ‘liberated’ followers of European ways. They were unpopular but no one could speak to them because of British rule. The women would sow seeds, and plough, and clean the ground, while the men would do the heavy work. Songs: We used to listen to Abdul-Wahab and Um Kulthum and Khayriyah Ahmad. We were allowed to go to the cinema. There was a cinema called ‘Al-Bourj’ [the tower]. And there was photography and radio. The ‘urosh was worth a lot in those days. And there were factories for sweets such as caramels and baklava, and cakes made with cheese. Vegetables were always plentiful because there were so many gardens. كان عمري 13 سنة لما طلعت من فلسطين. الاب: كان عمله بالصيد, عنده مركب صغير و الصيد كان مشلول, على الخفيف بالنهار و لكن الصيد الاساسي بالليل و الذهاب لبيع الاسماك. و كانت مشهورة بزراعة الحمضيات متل الليمون و الافندي و الخضراوات و كانت انظف شي و الاراضي منيحة. * العيد: منطقة بعكا زي الحرش للمراجيح و كان عنا محلات لتأجير الحمير و كان في تلة نابليون يروحوا يلعبوا هناك. * الحج: يلقوا الحجاج قرب محطة ( سكة حديد) و بعدين على حيفا و يتجمع اهل البلد ليروحو بالباخرة و كانت الطيارات قليلة. * الاجر: نفس هون, عنا ثالث يوم و الاسبوع و الاربعين يوم و كانوا يقدمو الاكل و الذبايح, و كانوا الجيران يطبخوا و ينظفوا البيت و كانو يساعدو اهل الميت و كمان الفقراء و كان في تبرعات لاهل الميت من اكل و مونة و مصاري. * الثأر: كانت عند الفلاحين و الناس بيحاكمو. * اما كيف يصرفو منتوجاتنا فكان في عنا سوق الخضرا و هناك كان في الحسبة و هي ينزل الفلاح مع اغراضه و يبيع الاغراض هناك و كان في مزاد كمان. و كان يشترو البقر و الحمير و الدجاج من سوق الدواب و الخيل من أسواق خاصة. * عكا فيها كتير محلات ذهب و مجوهرات و حلويات. و كان فيها مسلمين و مسيحية و يهود موزعين و كان في حارة اسمها حارة اليهود, كانو يحبو بعض و جدي رضعان من يهودية اسمها ام هارون. اليهود الشرقيين كانو عايشين من الاساس بفلسطين و عندهن نفس عادات و تقاليد فلسطين. اما اليهود الغربيين الي من اوروبا هم عنصريي و كان يصير مشاكل بين هادول اليهود و المسلمين. ايام المسيحين كانو يفسدوا للجيش البريطاني عن الفلسطينية و كانو الكل مسلمين سنية و كانو يقولو عن المسيحي نصراني. القماش كان يشترو من المحلات و يتخيط كنزة و بنطلون و صندل للعيد. * زيارة المريض: كنا نوخد حلويات و فواكه معنا. و كانت اكتر المستشفيات بحيفا و كان هناك مستشفيات كتير بعكا و كبيرة كمان. * ممنوع كان ينحكى بالسياسة و القومية العربية و الاّ ينحبس, كل واحد يحكي بالوطنية ينحبس و يوكل اتل ( ضرب) و يعذبوه و يخلوه يحكي عن اتباعه و حياته. * رمضان: كان يصوم جدي و كنا نزين الحارة و نعمل احتفالات بالمسا و الكل كان يروح يصلي العشاء بالجامع. رمضان كان احلى من هون لان كانت الجيران و الحي يعزم و يعمل سفرة للكل و كان في صدقات سرية و تبرعات من الكل بالسر. * كان في بنايات و عمار كتير. كان في مختار لادارة و حل مشاكل البلد و اذا ما كان يقدر يحلها كان يبعتها للحكومة و لكن كانت كل المشاكل تنحل سلمية. * كان في ثورة ضد الاستعمار و كان في سلاح بس السلاح مخفي متل رشدي السعدي من كبار الثوار و كان مطارد من الاستعمار. و كان يكون في مظاهرات و كان يكون فيها نسوان و رجال و كان الحج الحسيني, الامين الحسيني هو الزعيم. كانت تقاليدنا حلوة, كانت كل الناس بالحي تعرف بعضها, كل الناس حتى الولاد. الهجرة و السفر: عمي عبد السلام كان بالجيش الانكليزي, سافر على مصر للسغل بالباخرة. كانو يحكو قصص للاطفال بس ما بتذكرها. الشتاء: كنا نسمع لدعء الشتاء و نقولو و لكن عكا فيها مي ( مياه) كتير و ينابيع و ما كنا نتأثر بقلة المي. * خسوف القمر: كنا نكبر و نسبّح بالجامع و كان في خرافات سلق البيض بس يصير في خسوف و كانت العالم تروح على الجوامع و كان في جوامع كتيري و بالايام الاخيرة صار في مكريفون. و كان يضرب المدفع وقت الاذان من سور عكا. * كان في دواوين لنسوان و كان يحكو بالجيزة و الزواج و الطبخ و النميمة و كانو الولاد يلتهوا بالاكل و اللعب. كان في تمسّك بالدين: الكل كان محجب ولكن المتحررات التابعين للنظام الاوروبي كانو مش مرغوب فيهن و لا حدا يقدر يحكيهن عشان الحكم الانكليزي. و كانت النسوان تروح تزرع و تحرث و تنظف الارض و كانو الرجال يعملو الاعمال التقيلة. الاغاني: كنا نسمع عبد الوهاب و ام كلثوم و خيرية احمد و كنا مسموح نروح على السينما و كان في سينما اسمها البرج و كان في الفوتغراف و الراديو. و كانت العملة تعمل كتير بالقرش. و كان في معامل حلويات متل حلو الكراميل و بقلاوة و حلاوة الجبن. وكانت الخضرا دايما متوفرة عشان كان في بساتين كتيرة. The smallest coin, equivalent to 1/100th of a pound. I am from ‘Alma. I was twelve years old when we left Palestine. We used to work with olives and figs, and we were firm believers in religion. The Jews used to come at 2 o’clock at night to search the house. There was one time when they came at night and my daughters were praying, and the Jew came and wanted to come in to search. He kneeled and moved the prayer mat and entered inside. Some of them were good. Weddings: The women of the village would sew kaniva, and the bride would take five outfits with her. The wedding hospitality was laban immo and yakhneh with rice, meat, slaughtered lamb, with green beans and okra. The slaughtered sheep were served to the entire neighbourhood with rice. The bedouin ate with their hands, but we used spoons and plates. And whoever did not have money, the neighbors would cook and bring them food. The night of preparation -- before the wedding -- there was henna for the bride, as well as the dabkeh and songs. The next day they would dress her, and a woman would come to the house to do the bride’s hair and her maquillage. The party would sometimes last three days between her home and that of the groom’s family. And the family of the groom would come and take her to the orchards, where everyone went to dance and do the dabkeh. The girls danced alone and young men alone, though there was a village where young men and girls would do the dabkeh together, holding each other’s hands even though they knew it is not allowed by the shari’a. When his family came to take her, she would come out with her head covered with a silk veil that would be wrapped around her hands, and her brother would let her ride a horse and hold her hands. He would take her along with the young girls to the house of the groom’s family. The second and third day they would make breakfast for the bride, and parties, drumming, and singing. We didn’t have chocolate, or hard sweets, or chips. There were only biscuits [biskweet]. There were only two shops in the neighborhood though the village was large. They used to make soap and olive oil, and there was hand-based industry. They had a mill. But there weren’t citrus fruits such as oranges or lemons because there wasn’t much water. In winter they would go to an old well which would dry up in summer, so then they would go to Wadi ‘Owja between two mountains. ‘Alma was famous for its olives, figs, grapes, apricots, plums, pomegranates, courgettes, and eggplant. Cultivation was only rain-fed. We had cows and sheep as well. I used to go and pick figs of several kinds, and we sent them in baskets we made with our own hands. All kinds of ripe and long figs, and gazelle figs. The mukhtar of the village, Abu Sa’eed, was always cheerful and unassuming. My mother was very religious, and she didn’t allow us to gossip with people. They didn’t marry girls young, they had to be twenty or more. But there were early marriages. The feasts were the same as now, for three days, every woman in her house baked cakes for the ‘Eid, and the yellow cakes (al-‘Abaas cakes), made of dates, walnuts, and almonds. They didn’t ever buy manufactured oil, it was always olive oil. And we had an olive mill. Children would play, but the young girls wouldn’t go out of the house because it was shameful. Two days after the ‘Eid, girls would go to some of their friends. The families of the village were intertwined. Everyone visited everyone else. There was a saying that went: Don’t ever eat cows of the Gholan or cows in spring, for all of them are fat and full of lard. They used to bring citrus fruits from the market of Safad. Preparations for the hajj: There were songs of blessing and special clothing for the hajj. It cost a lot, and took three months. They would go to Safed on foot, and then to Haifa by car, and from there by boat to Jordan, and then to Saudi Arabia. Ramadan: People would invite each other, relatives would gather together. We would decorate the quarter only on the day of the ‘Eid. For funerals and mourning, the neighbors would usually cook for the family of the dead person for three days. Make-up was forbidden even at home [during the time of mourning]. It was forbidden for everyone because they adhered to religion -- except at the time of weddings. For weddings the bride would put on kohl, lipstick, and powder. But she would cover everything with a shawl, even at home. There were no Jews, only Muslims and bedouin [in ‘Alma]. Sometimes we would buy clothes from Haifa, but mostly cloth. There weren’t any poor people. If people didn’t have a craft, they would mostly work in agriculture. There weren’t any jewelry shops. They used to bring gold from Bint Jbeil in Lebanon. The people of Bint Jbeil were poor. The first part of the dowry for a bride used to be in gold liras and bracelets. As to visiting the sick, a young girl wouldn’t go with her family to visit a sick person, it was the older women who went. They were so generous that they would send a dish of food every day to the sick person or the poor one. They went to sell their produce in the markets of Safed. They sold leban there. All the families of the village loved one another, and neighbours loved each other. Circumcision: They would gather in the house, and sing songs and play the daff. There was no travel by airplane. Giving birth: There were Arab midwives. Health clinics: There were clinics, but they were simple – enough if someone was wounded or needed stitches. But they didn’t distribute medicine or anything. Entertaining: [Guests were served with] tea and coffee. Shi’ites would come in search of provisions, they would seek a livelihood. For example they would come from Lebanon to sell clothes -- sewing and embroidery and kaniva for hand work, abayas and qumbaaz, and underwear. It was forbidden to stay out late or sleep outside the house. When a woman became a widow, when her husband died, she would stay in the house to bring up her children. If a widow sought to marry, most people would not be willing. The lunar eclipse: The sheikhs would go and glorify God and praise Him in the mosque. Sometimes the rain would be slow in coming, and the men would go to the threshing floor, and they would pray “Let rain come, provide for us! And cover us when we are unclothed”. And God be praised, our Lord would respond to their appeal and it would rain. When people were invited to a wedding, young girls would embroider long trousers to wear underneath their abayas. The Thursday of the Dead: They would feed the spirit of the dead. But not everyone would do it. It was just for three days. Women’s gatherings: All the women of a family would get together-- the daughter-in-law, the sisters, etc. There were some people who created spells for others [to protect or to hurt]. The gypsies long ago didn’t fast and weren’t faithful to religion. In regard to prison, some people would not accept compensation (diyya), they insisted on vengeance. Other people would pay a lot of money to the family of the dead person. Some people insisted on revenge, other people no. There was a revolution, and when there was someone wanted by the army, they would enter and take the food and pulses to the courtyard and throw oil on them to ruin them -- this was if they didn’t find the accused. But at times they would enter and find him and take him. Of the most famous revolutionaries in ‘Alma was Ahmad Hassan -- they followed him to Safsaf and killed him. Another was Abu Hamoud. The country was in turmoil. We left Palestine straightaway for Bint Jbeil. Afterwards they took us in army buses away from Bint Jbeil, they said so that the young men wouldn’t carry out suicide operations, because Bint Jbeil was close to Palestine. The Arabs were the ones who made us leave. Most of the women at that time did embroidery. بدور عيسى الدرباس من علما و كان عمري 12 سنة لما طلعنا من فلسطين. كنا نشتغل بالزتون و التين و كنا كتير متمسكين بالدين. كانوا اليهود يجوا الساعة 2 بالليل و يفتشوا البيت. و في مرا اجوا الليل و كانوا بناتي عم يطلو, قام اجا اليهودي بدو يفوت يفتش. وطّى و زاح المصلية و فات لجوا... كان في البعض منهن مناح. العرس: كانو النسوان بالبلد يخيطو كنفة و كانت العروس توخد معها 5 غيارات. و كانت ضيافة العرس لبن إمه و يخانة مع رز , لحمة, ذبح خرفان و فاصوليا و بامية. الذبايح كانت لضيافة الحارة كلها و مع رز. البدو كانو يوكلو بايدهن و لكن احنا بالمعلقة و الصحن و يلي ما معو مصاري كانو الجيران يجيبولو و يعملولو اكل. و السهرة ( التعليلة) و كانت حنة للعروس و دبكة و اغاني و تاني يوم بيلبسوها, وكانت تيجي وحدة علة البيت تعملها شعرها و مكياجها و الحفلة مرات تضل 3 ايام عند اهلها و اهله. و كان ييجوا اهل العريس لياخدوها على البيادر ( الحقلة) لحتى الكل يروح يرقص و يدبك و لكن البنات لحالن و الشباب لحالن. و لكن هناك بلاد ( قرى او ضيع) كانو يدبكوا شباب و صبايا مع بعض, يمسكو ايدين بعض و لكن بعلما غير مسموح شرعا. لما يجوا اهله ياخدوها, تطلع لابسة على راسها ( ايشار حرير, يربطولها ايدها فيه و اخوها يركبّها على الفرس و يمسكلها ايدها) و ياخدها على بيت اهل العريس و ياخدوها هناك الصبايا. و تاني يوم و تالت يوم يعملولها صباحية, حفلة و دق و اغاني. الزرع فقط من الامطار و كان عنا بقر و غنم. العيد متل العيد ب 3 ايام, كل وحدة بيبتها تخبز و تعمل كعك العيد و كعك اصفر ( كعك العباس): تمر و جوز و لوز و ما كانو يشتروا زيت معمل بالمرّا, كلو زيت زيتون و كان عنا معصرة زيتون. هناك مثل بيقول: عمرك ما تاكل من بقر الجولان و لا من بقر الربيع لان بيبقى كله دهن و ناصح. كانوا يجيبوا من صفد ( اسواق صفد) الحمضيات. الحج: تحنين: اغاني مباركة و خيا القصايل و كتير غالي و كان على 3 اشهر. كانو يروحو على صفد مشي و من صفد على حيفا بالسيارة و هناك بالباخرة على الاردن و بعدين على السعودية. كان ممنوع المكياج و لا حتى بالبيت, كان للكل ممنوع عشان كان في تمسك بالدين الا وقت العرس, كانت العروس تحط كحلة, حمرا, بودرة و لكت تغطي بشال كل شي و لا حتى بالبيت. ما كان في يهود بس مسلمين و بدو. اما زيارة المريض, البنت ما كانت تروح مع اهلها لزيارة المريض و لكن النسوان الكبار يروحو و حتى كانو كتير كرماء فا كل يوم يبعتوا للمريض او الفقير صحن اكل. خياطة و تطريز و كنفة يدويا و عبايات و قمباز: شلحة تحت التياب. بالنسبة للحبس, بعض الناس كانوا ما يقبلو الديّة ( المال) كانو ياخدو بالطار. بعض الناس كانو يدفعوا مصاري كتير لاهل الميت. في ناس بتستخدم الطار و بعض الناس لاء. كان في ثورة و لما يكون في واحد مطلوب للجيش كانو يفوتوا ياخدو الاكل وا لحبوب كلها على المصطة و يكبوا عليه ويت عشان يخرب ( هاي اذا ما لاقوا المتهم) بس مرات يفوتو و يلاقوه و ياخدوه. This story is puzzling. Badour was too young to have had daughters in Palestine. In Lebanon, a soldier searching her house could not have been Jewish, unless she was living in the South during the Israeli occupation (1982-2000). Unfortunately Badour became too frail after the interview to be questioned. Kaniva was the coarse-weave material used as basis for embroidery. Teen biqraat wa shamata, names not known in the camps today. The Quran strongly discourages gossip as hateful (makruh).